Ignatius was born in 1491 to a noble family in the Basque country of Spain. He was the youngest of 13 children and was only seven when his mother died. When he was 29 and fighting against the French who were attacking Pamplona, a cannonball shattered his leg. Ignatius spent a year in bed recovering from his wounds. When he was 30, Ignatius turned from working as a soldier to working as a missionary for God. 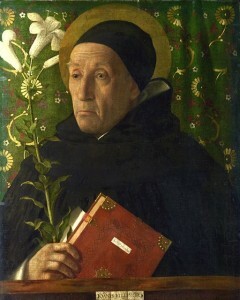 During that year, Ignatius read the Bible and about the lives of saints. In these books, he discovered new work. He would “find God in all things.” He would do everything “for the greater glory of God.” His actions, decisions, and plans would bring the good news of God’s love to others. He visited a monastery, where he took his military clothing and weapons and laid them before an image of the Blessed Mother. And at the age of 30, Ignatius went back to school to learn more about his faith. Soon, a group of six men gathered with him. In 1540, the seven together became the Society of Jesus—the Jesuits. Ignatius was their leader. Ignatius sent the Jesuits around the world to build schools and colleges to teach people how to work for God. 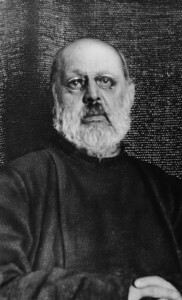 He himself loved to teach the faith to young people. 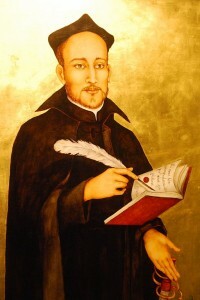 The Jesuits became missionaries and spread the good news of God’s love far and wide. They followed Ignatius’s 1548 book, Spiritual Exercises. In that way, they grew closer to God by using God’s gifts and grace. Ignatius died in Rome in 1556, when he was 65 years old. He was canonized by Pope Gregory XV in 1622. 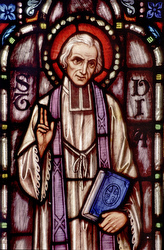 He is a patron saint of Catholic soldiers, and many Jesuit schools and universities throughout the world are a tribute to his work and his faith.